January 27 was international Holocaust Remembrance Day, the 74th anniversary of the liberation of the death camp at Auschwitz-Birkenau. In this time of many refugees and fierce debates about where they can find refuge, it seems timely to remember the Jewish refugees who fled—or tried to flee—Nazi-occupied Europe, and the international debates over who, if anyone, would take them in. When the Nazis first came to power in Germany they did not prevent Jewish emigration. They claimed to encourage it in their attempt to make Germany, and later Nazi-occupied Europe, judenrein—devoid of Jews. They did make it very difficult for German Jews to transfer their assets outside Germany, and they required Jewish emigrants to get “certificates of harmlessness’ approved by the Gestapo as well as proving that they had turned over their valuables. Nevertheless, more Jews were cleared for departure than ever found refuge in other countries. In theory, other countries were aware of the need. In the summer of 1938, Western countries met at the Evian Conference to discuss the refugee crisis; they made statements of concern, but very few actually offered to take in significant numbers of refugees. Even after the widely reported violent pogroms of Kristallnacht in November 1938 most countries kept their admissions quotas low and refused visa requests. The reasons for this varied depending on the countries, and there were a few exceptions. The US had passed immigration quotas in 1924, strictly limiting the number of immigrants it would accept from places other than England and Northern Europe. These quotas were partly inspired by the report of the government’s Dillingham Commission, which claimed that unassimilated, unassimilable immigrants from southern and Eastern Europe threatened the integrity of the US. The reports also claimed to describe differences in intelligence and moral character between immigrants of different ethnicities. Furthermore, during the economic depression of the early 1930s many native-born Americans viewed immigrants as competitors for jobs that were already too scarce. So at the Evian Conference the US refused to raise its immigration quotas (which allowed 27,000 people a year from Germany and Austria) and admit Jews fleeing the Nazi regime. There was a domestic interfaith effort to raise the quota for humanitarian reasons. In 1939 the Wagner-Rogers Bill, which would have admitted 20,000 Jewish children into the US, was introduced in both houses of Congress—where it failed to pass out of committees for a general vote. Also in 1939 the ship St Louis, which had taken refugees to Cuba and been turned away, sought admission to the US, which also refused them. The ship and its passengers returned to Europe, where more than 250 of its 900 refugee passengers died in the Holocaust. As the war intensified in Europe, refugees were described as national security threats, and administrative directives denied visas to people who might have been admitted under the legislative quotas. In June 1941 US diplomats were told that visas would soon be denied to people who had relatives in German-occupied countries who might be taken hostage and used to blackmail the emigrants into committing espionage or sabotage. In 1942 one man, Herbert Karl Friedrich Bahr, applied to enter as a refugee and was found to be a spy. No other such cases among the many thousands of refugees who sought asylum from the Nazis in America are known to historians, but at the time his case made it much easier to turn genuine refugees away. At the Bermuda Conference of 1943 the US again refused to increase admissions. In 1944 the Treasury Department, whose presiding Secretary was Jewish and deeply concerned by word of the Holocaust, prepared the “Report to the Secretary on the Acquiescence of This Government in the Murder of the Jews,” and the government formed War Refugee Boards. From 1945-48, in the aftermath of the war and the liberation of the concentration camps, the new President Truman’s directives brought nearly 40,000 people displaced by war, many of them Jewish, to the US. Britain also strictly limited the immigration of adult refugees to its own soil. In 1939 when war broke out it also curtailed the immigration of German Jews to Palestine, which it controlled. But the persistent efforts of children’s aid committees persuaded the government to accept child refugees in the aftermath of Kristallnacht. Under the Kindertransport program, children under seventeen were allowed to immigrate from Germany and German-annexed territories, without their parents or guardians, so long as individuals or NGOs were willing to pay for their care; it was also understood that once the crisis was past they would leave. A few infants were sent through Kindertransport in the care of older children. The first Kindertransport arrived in December 1938, and children continued to arrive into 1940, when the Nazis effectively prevented Jews leaving for Britain. About 10,000 children came to Britain via Kindertransport; about 7,500 of those children were Jewish. In 1939 Britain began interning ‘enemy aliens’ in case they might be spies or saboteurs. 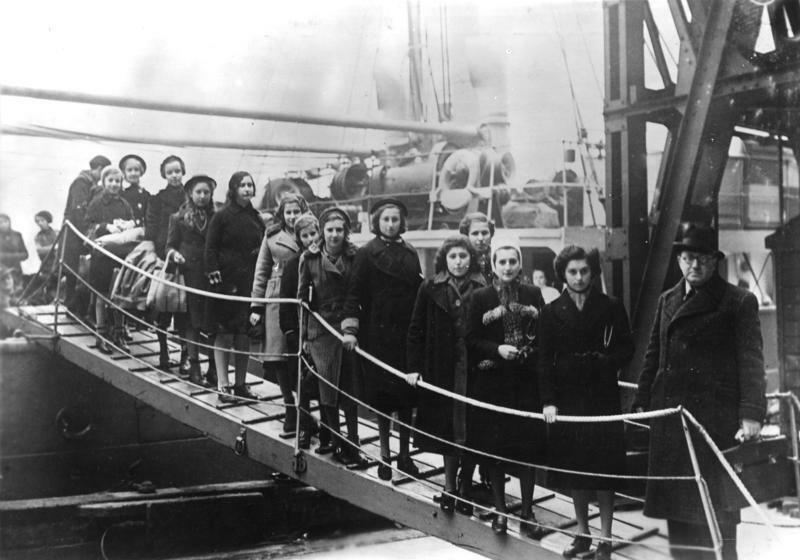 About 1,000 teenagers who had arrived via Kindertransport were sent to internment camps. Some of these internees joined the British armed forces once they were of age. After the war it became clear that many of the Kindertransport refugees had been orphaned and could not return home as first envisioned. Many became British citizens or emigrated to Australia or America. Nearly 100,000 Jewish refugees emigrated from Germany and Austria to other countries in Europe that were then overrun by the Nazis. Most of these died in the Holocaust. About 40,000 entered Spain, whose vague and contradictory policies allowed considerable discretion to local officials; many of these fled further rather than remaining there. Switzerland accepted about 30,000 Jewish refugees, many of whom were kept in camps apart from the main population, and turned nearly the same number away. After the war ended, hundreds of thousands of Jewish Displaced Persons were sheltered in camps run by the Allies in Italy, Germany and Austria. Latin American immigration policies were generally growing more restrictive over the 1930s in the wake of economic depression—just as the refugee crisis was growing. About 84,000 Jews were resettled in Latin American nations over the war years. After 1941 this was largely a result of the German ban on emigration, but in earlier years the restrictions came largely from populist and nativist sentiment in the host countries. There were exceptions. Bolivia, thanks in part to a Jewish business leader with ties to their President Germán Busch, welcomed more than 20,000 Jewish refugees; some moved on (without papers) into other Latin American countries, but many stayed. Brazil and Mexico took in significant numbers of refugees from Nazism, and the Mexican consul Gilberto Saldivar, posted to Vichy France, ordered his staff to issue Mexican visas to any refugee who asked for them. The Dominican Republic offered to take any number of Jewish refugees if they had means to ‘contribute to the country’s enrichment’ and would agree to establish an agricultural settlement in an area designated by the government. Some historians see this as an attempt by the Dominican dictator Trujillo to ‘whiten’ the population of his country—or get people to overlook his own history of killing civilians. Fewer than 1,000 Jewish refugees actually settled in the DR, but about 5,000 DR visas were issued, allowing refugees to get out of Germany. One exit destination that required no visas was the city of Shanghai, some parts of which were controlled by the Chinese (or, after 1937, the Japanese, who were getting the upper hand in the Sino-Japanese War) while other parts were controlled by various foreign powers which traded there. Shanghai was already home to a few thousand Jews who had emigrated either for business or (especially in the case of Russian expatriates) to escape pogroms. Nearly 20,000 Jews emigrated from Nazi-occupied lands to Shanghai’s international quarters. Most of these arrived in late 1938 and early 1939, after Kristallnacht and before the Japanese imposed immigration restrictions. Many of them settled in the very affordable Hongkou neighborhood, which became known as “Little Vienna.” Shanghai was struggling economically as a result of the war, and the international sectors had also become home to Chinese refugees, but locals still welcomed the new refugees. The Japanese occupying forces were less welcoming. Germany urged them to eliminate the Jewish population through heavy forced labor, ration cuts and medical experiments. The Japanese refused to do this, but in 1943 they did require all Jews to be contained within Hongkou, which was already overcrowded. There was little privacy, and too often little food, but still the refugee population survived the war. After the war many returned to Europe, and some others fled the Chinese civil war in 1939.